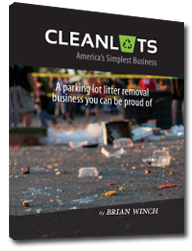 My name is Brian Winch, and I want to show you how you can “cash in” on a simple parking lot litter cleaning business. If you’re considering small business ownership but don’t have thousands of dollars to start one, a college degree or much business experience, it can be challenging to get started. I thought the same at first but in 1981 I started providing commercial litter cleaning services for commercial property management companies. I cleaned up parking lots, sidewalks and landscapes each night for a few dozen properties. I just used a broom and litter scoop tool and I walked around each night keeping these properties clean. Thirty years later, I’m still doing it and I’ve had a great life. I’ve been earning a 6 figure income from what amounts to going for a walk each night. I’d like you to experience the same opportunity. I’ve written an operations manual to help you learn the in’s and out’s of this low cost lifestyle business and show you how to provide this essential service to the businesses in your area. So far, I’ve found this business to be largely recession proof as litter is a year round problem for most companies, regardless of the economy. Plus you’ll be one of the easiest and most affordable options available. My Cleanlots training manual is only $79.95 and I even include FREE phone support to get you started. All you need is the drive and determination, and you’re on your way to taking charge of your life. While cleaning parking lots may not seem glamorous, it works in your favor as many people will overlook this lucrative opportunity in favor of more traditional businesses. I hope you take this opportunity seriously and spend a few minutes looking around my website. I’ve tried to answer all the common questions and to provide you with enough information to appreciate this opportunity. If you’re looking for a simple, low cost, low risk small business you can operate from home part-time or full-time, Cleanlots is worth a serious look.